Ferroelectric BaTiO3 films have been epitaxially grown by pulsed laser deposition on buffered Si substrates. We show that BaTiO3 films texture is selectable by appropriate choice of Si wafer orientation and buffer layers. BaTiO3 films having (00l), (l0l) or (l0l)/(l00) texture present very flat surface, low current leakage, and sizeable ferroelectric polarization. 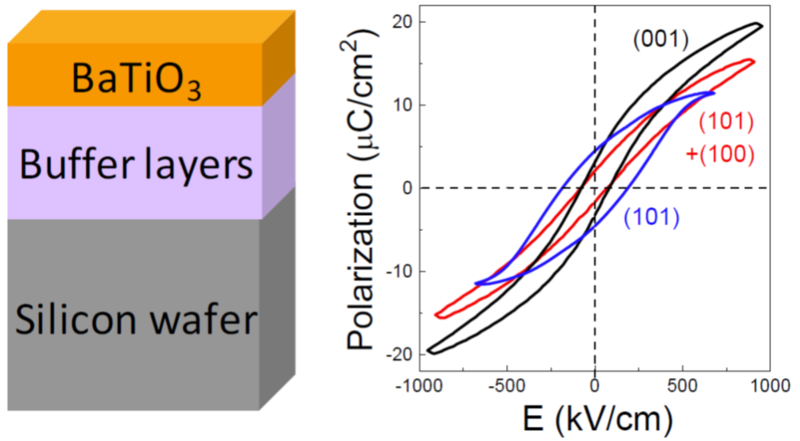 The films, integrated on silicon platforms, offer opportunities to exploit anisotropic optic and dielectric properties of ferroelectric BaTiO3.